A small, sinewy, lean, lively dog whose sparkling personality and quicksilver intelligence are reflected in the vibrant expression of his unique triangular head and windswept face. A superb athlete, his beautiful, flowing gait "shaves the earth." Uncoiffed, lightboned and built as a horizontal rectangle, his high energy and intelligent, cunning, mischievous attitude show that he is always on alert, suspicious, ready for action. An ardent herder of all kinds of livestock, his vigilant attitude and great vivacity of movement give this little dog a highly singular gait and appearance, characteristic of no other breed. The Pyr Shep is naturally distrustful of strangers, but when well-socialized from a young age, he or she has a very lively, cheerful disposition. The two varieties, Smooth-Faced and Rough-Faced (including both demilong and long-haired coat types), are born in the same litters. Size - Rough-Faced: males 15½ to 18½ inches at the withers, females: 15 to 18 inches. Smooth-Faced: males 15½ to 21 inches at the withers, females 15½ to 20½ inches at the withers. Weight - An absolute minimum of weight is required - just enough flesh to cover the bones; the ribs should be readily felt. Disqualification - Individuals under the minimum height, or exceeding the maximum height by more than ½ inch. Proportion - In Rough-Faced dogs the body is clearly long (from the point of shoulder to the ischium) in proportion to the height of the dog, whereas Smooth-Faced dogs appear much more square. Substance - The dog in good working condition is lightly boned and sinewy, correctly proportioned and well-balanced, and must never appear overdone. The head is generally triangular in shape, rather small in proportion to the size of the dog, well-filled-in under the eyes; the top skull is nearly flat. Expression - Intelligent, alert, and cunning, even a little mischievous. Eyes - The eyes are almond-shaped, open, and very expressive. They are neither prominent nor deeply set. They are dark brown in color. Partially or completely blue eyes are acceptable only in merles. Eye rims are black no matter what color the coat. Disqualification - Missing pigment on the eye rims. Disqualification - Blue eyes in a dog of coat color other than merle. Ears - Both cropped and uncropped ears are equally acceptable. The ears are rather short, moderately wide at the base, set on top of the head. Ears are traditionally cropped straight across and stand erect. Natural ears are semi-prick with one-third to one-half of the leather falling either straight forward, or to the side in the case of a rose ear. Skull - The skull is almost flat on top with only a slight central furrow, gently rounded on the sides, and with only a slight development of the occiput. The top of the skull slopes gently to the nearly-parallel muzzle with no marked stop, and the sides of the skull blend gently into the muzzle, giving the head a triangular wedge shape. Faults - too much hair on the head - particularly if it veils the eyes. Muzzle - Straight, slightly shorter than skull, it lets the skull dominate the face; narrow, but not exaggeratedly so, it affects a wedge shape, well filled-in under the eyes. This lends a triangular shape to the head. In Smooth-Faced dogs, the muzzle is slightly longer and more pointed than in the Rough-Faced dog. This is emphasized by the distinctive smooth face with its short, fine muzzle hair. In Rough-Faced dogs, the hair on the end of the muzzle and chin must be naturally short and it lengthens as the muzzle widens toward the skull. This gives the characteristic windswept appearance so necessary for correct expression. Nose - Black. Disqualification - Nose other than black. Lips - Tight-fitting, often giving the impression that the dog is smiling. The mucous membranes of lips and palate are black or strongly marked with black. Bite - The teeth are large and strong. Complete dentition is preferred. A scissors bite is strongly preferred, an even bite is admissible. Faults - More than 1 missing incisor or 2 missing premolars. Teeth broken or missing by accident shall not be penalized. Disqualification - Overshot or undershot bite. Neck - Rather long, well-arched flowing smoothly into the shoulders, and well muscled, well set from the shoulders. Topline - The topline is firm and strong. The tops of the rather long shoulder blades clearly project above the line of the back. The back is level. The loin is slightly arched, and is slightly higher than the top of the shoulder blades. In Rough-Faced dogs, especially among the long-haired coat type, the rounded loin is accentuated by the coat. In Smooth-Faced dogs, the topline appears much more level. Body - Cleanly boned, the body is rather long and well supported, the loin is short, the croup is rather short and oblique, flank well tucked up, ribs slightly rounded and extending well to the rear. The chest is of medium development and descends only to the elbow. Tail - The tail may be docked, natural bob, or naturally long. All are equally acceptable. The naturally long tail must not rise above the level of the back but should continue along the slope of the croup. It should be set on rather low and forming a crook at the end; well fringed in Rough-Faced dogs, well plumed in Smooth-Faced dogs. Shoulders - Shoulder blades are rather long, of moderate angulation. Upper Arm - Oblique and moderately long. Forelegs - Light-boned, sinewy, rather finely made. RoughFaced: Fringed with rather long hair in long-haired dogs, rather shorter hair in the demi-long haired dog. Smooth-Faced: The hair is short on the fronts of the legs, and may be furnished with feathering along the back of the leg from elbow to pastern. Pasterns - Strong, sloping. Dewclaws - The front legs should carry single dewclaws, not to be removed. Feet - Oval shaped. The foot of the Smooth-Faced dog is a little shorter and more cupped than in the Rough-Faced dog. The pads of the feet are dark. Nails - The nails are hard and dark. Hind Legs - The stifle is well bent. The upper thigh is rather short. The lower thigh is long. The hocks are clean, well let down, well angulated and often close together. When viewed from the rear, the legs present parallel columns of support from hip to hock. RoughFaced dogs with demi-long coat are generally not as heavily furnished in the rear as the longhaired dogs. Feet - The foot of the Smooth-Faced dog is a little shorter and more cupped than in the Rough-Faced dog. Dewclaws - Double dewclaws, single dewclaws, or lack of dewclaws in the rear are all acceptable, however as dewclaws are an ancient breed characteristic, all else being equal, the dog possessing dewclaws must be preferred. Feet - Oval shaped. The foot of the Smooth-Faced dog appears a little shorter and more cupped than in the Rough-Faced dog. The pads of the feet are dark. The hind feet characteristically toe out slightly and this must not be faulted. Coat quality is more important than abundance. Rough-Faced - The Rough-Faced dog's coat can be of long or demi-long hair, almost flat or slightly wavy. Demi-long dogs have culottes on the rump, while the long-haired dogs are often more heavily furnished with woollier hair that may cord, especially on the elbows, croup, and thighs, but never on the head. The texture is harsh, being halfway between the hair of a goat and the wool of a sheep. The undercoat is minimal. The hair on the end of the muzzle and the chin must be naturally short and it lengthens as the muzzle widens toward the skull. The longer hair on the sides of the muzzle and cheeks is swept back giving a windblown look. The eyes must be readily visible, not veiled by hair. Smooth-Faced - The muzzle is covered with short, fine hairs, hence the term Smooth-Faced. hair becomes somewhat longer on the sides of the head, blending into a modest ruff. The hair on the body is fine and soft, attaining a maximum length of no more than 3 inches for the ruff and culottes, 2 inches along the back. The fronts of the legs are covered with short, fine hairs; there is often some furnishing on the elbows and thighs. Faults - Excessively long coat, excessive furnishings. Too much hair on the head, especially if the hair veils the eyes or displays a pronounced moustache or beard. No ribbon shall be awarded to a dog whose coat has been scissored, especially on the face, except for neatening of the feet. Various shades of fawn from tan to copper, with or without a mixture of black hairs; grey, ranging from charcoal to silver to pearl grey; merles of diverse tones; brindle; black; black with white markings not exceeding 30 percent of the body surface. A little white is acceptable on the chest, head, and feet. Faults - Too many white patches or white patches that are too big; black with tan points. Disqualifications - White coat color covering 50 percent or more of the body. Gait: The trot - our little shepherd's favorite gait - must be solid and vigorous. At the jog trot, the head is carried rather high. As the stride lengthens the head lowers to become level with the backline. It is a very flowing gait. The feet barely leave the ground. He "shaves the earth." The correct gait is very pleasant to the eye. It is a result of the harmony of the front and rear angulations. As speed increases, the legs converge under the body toward the centerline. 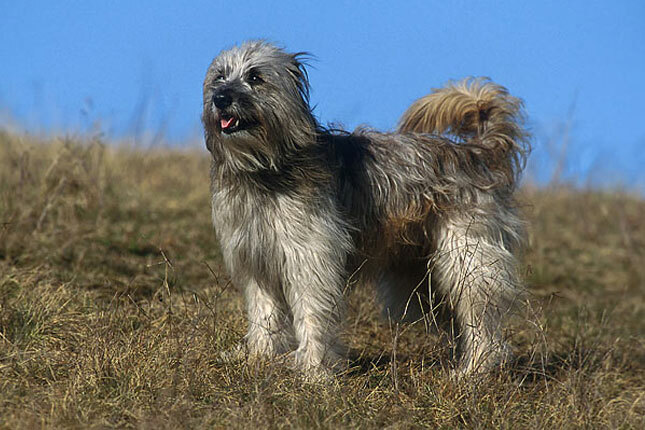 The Pyrenean Shepherd is not merely a header or a drover. Such a division of labor is unknown to him. He is a versatile herder to his very soul and has the intelligent initiative to adapt to all manner of changing circumstances in order to fulfill the human shepherd's every need with unequalable prowess. The powerful herding instinct is so strong in him that from the very youngest age he knows how to manage the flock even without the example of an older dog. He is dominated by his love for his work. He has the tendency to become passionately attached to his owner to the complete exclusion of all others and is astonishingly sensitive to his owner's moods. As a companion, he is very active and enthusiastic and insists upon being involved in the day's activities whatever they may be. He is very affectionate with the members of his immediate family, but is distrustful of strangers. Individuals under the minimum height - Rough-Faced: males - under 15½ inches at the withers, females - under 15 inches at the withers. Smooth-Faced: males - under 15½ inches at the withers, females - under 15½ inches at the withers. Individuals exceeding the maximum height by more than ½ inch. Rough-Faced: males - more than ½ inch above 18½ inches at the withers, females - more than ½ inch above 18 inches at the withers. Smooth-Faced: males - more than ½ inch above 21 inches at the withers, females - more than ½ inch above 20½ inches at the withers. Missing pigment on eye rims. Blue eyes in an individual of coat color other than merle. Nose other than black. Overshot or undershot bite. White coat color exceeding 50 percent of the body. Click Here to Learn about breeder background checks on Pyrenean Shepherd breeders if you are looking for Pyrenean Shepherd puppies for sale. Click Here to learn how ResearchBreeder.com can help you find healthy Pyrenean Shepherd puppies for sale.Pyrenean Shepherd puppies for sale. Click Here to order a Breeder or Kennel Background Check on Pyrenean Shepherd Breeders that may have Pyrenean Shepherd puppies for sale. Click here to find the national breed club for Pyrenean Shepherd puppies for sale. Click Here to purchase a list of approved ResearchBreeder.com Pyrenean Shepherd Breeders who have Pyrenean Shepherd puppies for sale.